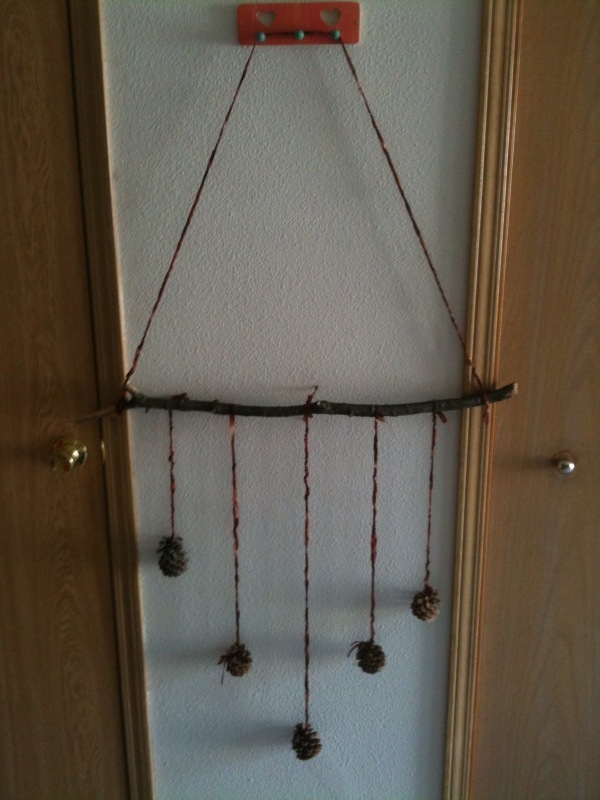 Remember the bird feeder I started making with just found materials? I finally was able to finish it this morning. I used some cheap-o peanut butter (that’s important, because you’ll use almost the whole jar) and spread it on the pine cones with a knife, filling all the holes. Try to get the top and bottom. 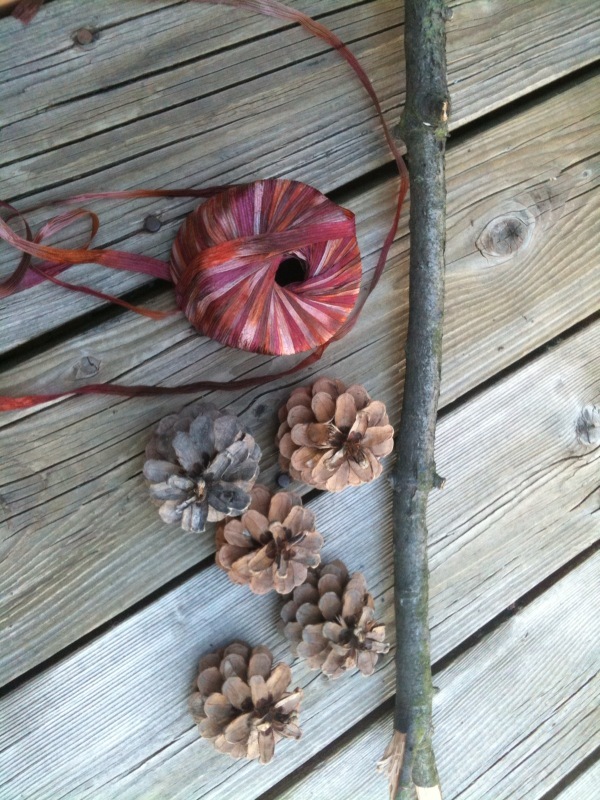 It can get messy, so hold on to the pinecone at the top, where it is connected to the braided yarn. 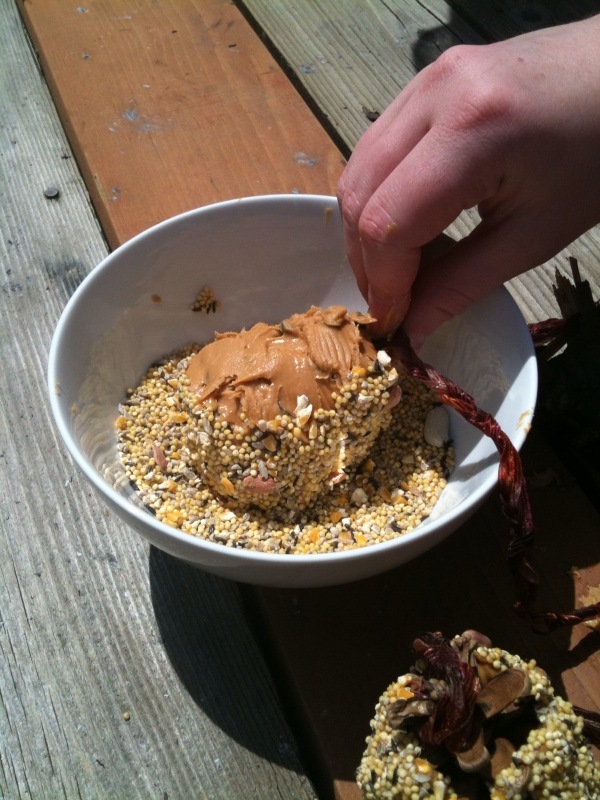 Then pour your bird seed into a bowl, and roll the sticky-peanut buttery-pinecone in the seed. I just got a cheap, “no sprout” mix from my local gardening store, but you can choose multiple kinds of seeds tailored to attracting certain birds. 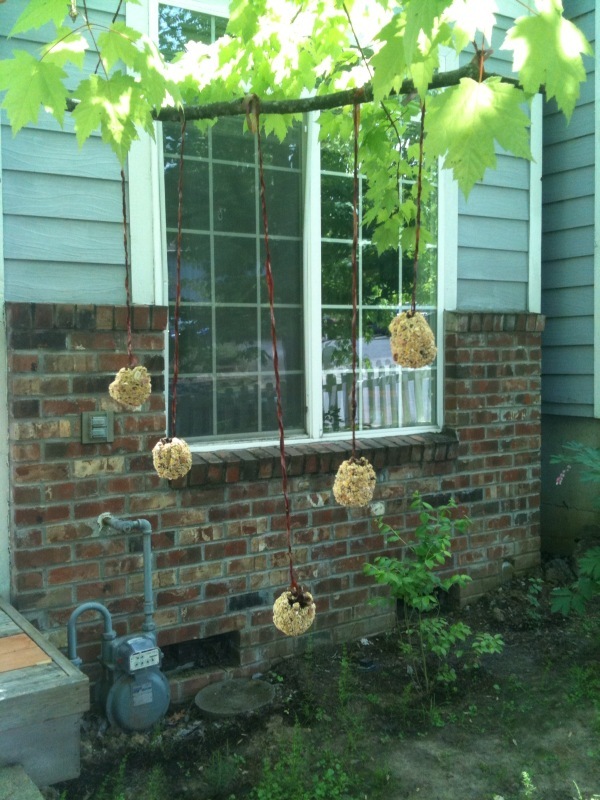 Then hang your completed bird feeder from a tree and enjoy! If you missed Part 1 of this tutorial, check it out here. I read this post about strangers bonding over knitting in a San Francisco park despite age, cultural and language barriers, and thought it was the sweetest thing (I may have even cried, but I’m not telling). However, the one thing that really stuck with me was the mention of keeping unused colors tightly wrapped around the edge…I realized that I’d never knit with more than one color yarn before! 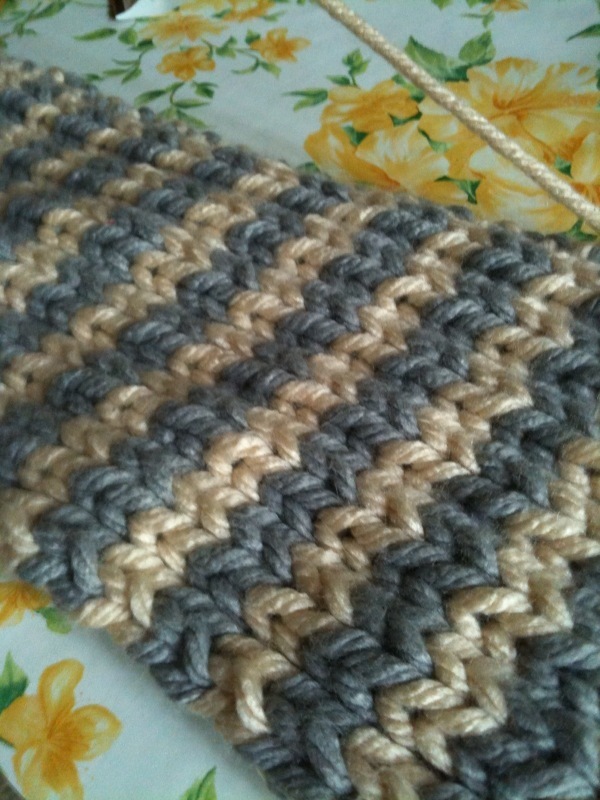 I had used self-striping, multi-colored yarn but that was the easy way out. It was time to learn to “carry yarn,” also known as “stranding.” Luckily, it was easier than I thought! Basically, you just wrap the color you are switching to around the color you just finished using. Here is a video from Lion Brand Yarn showing how to simply carry yarn which really helped me. Cut the paper of your choice into strips. 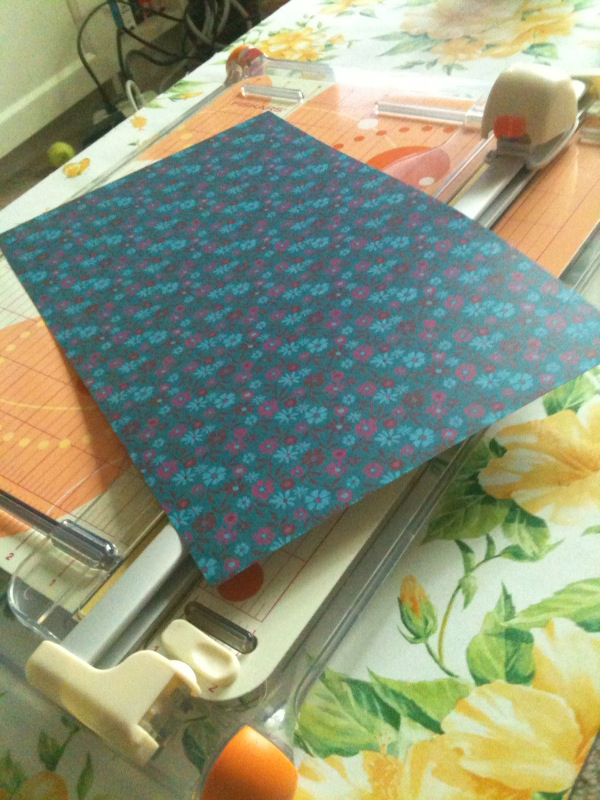 I take 12×12 scrapbook paper and cut it into 1/2 x 11 inch strips using a rotary cutter. Any paper will work, just as long as it isn’t too thick like cardstock. Also, you can cut thicker or thinner strips for different sized stars. Make a knot close to one end of your paper. 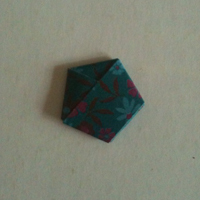 Pull it tight without overlapping any of the sides, to create a 5 equal sided pentagon. Fold over/tuck in the short end. Begin folding the remaining strip over and over your pentagon. The angles will automatically line up along each side of the pentagon. 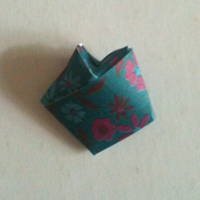 Fold as crisply as possible. 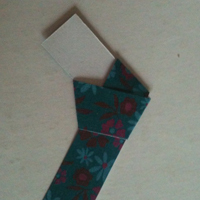 When you have an end that’s too short to fold anymore, tuck it into the previous fold. Now you have a flat pentagon. 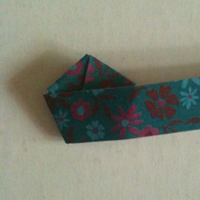 Hold onto two edges and press the opposite edge in with you fingernail. Repeat with the remaining sides. 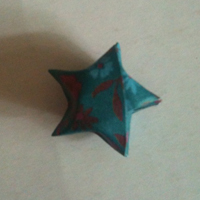 This will puff up your little paper pentagon into a star! And that’s it! Use these cute little stars for whatever you want. You can write little wishes/compliments on the inside and fill a jar with them as a gift. 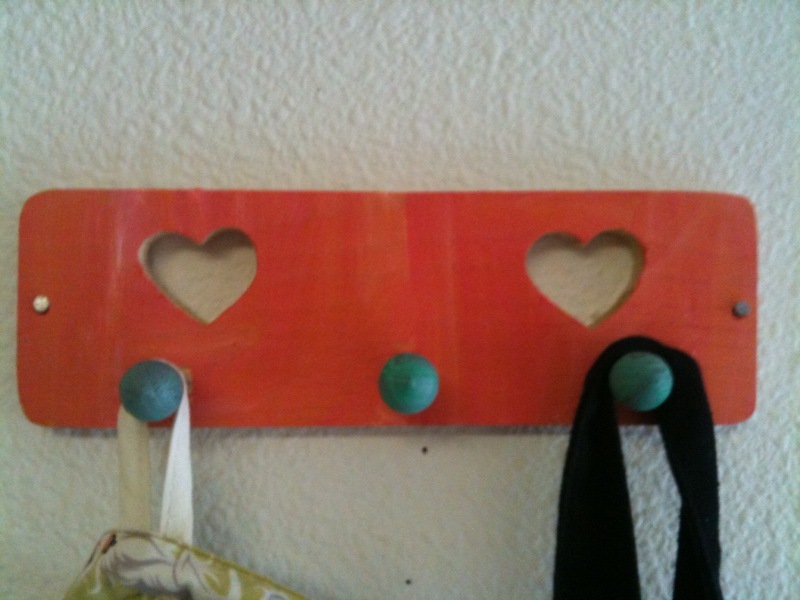 I have two long strands of them in my craftroom that are bright and cheery. 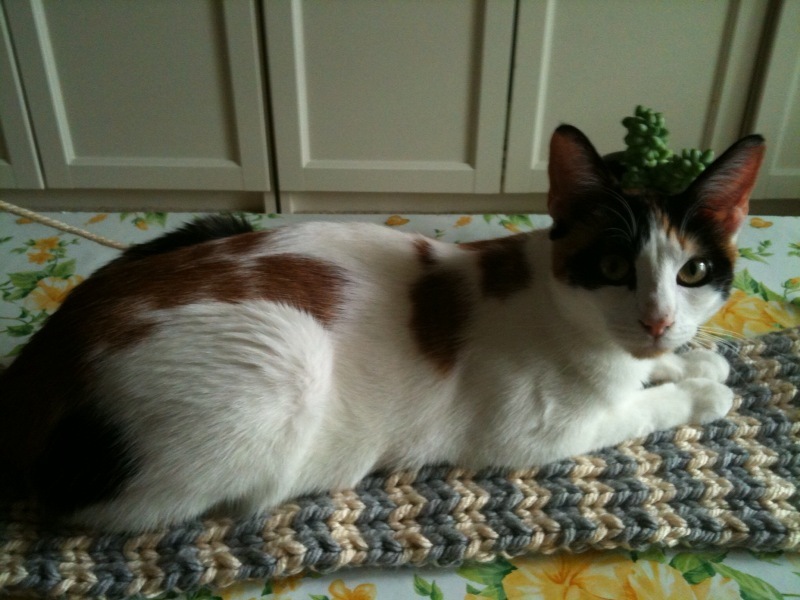 Like anything I make, my cat thinks the stars are a toy for her. Here is a video of her attacking the stars, which no matter how often I clean up, I seem to find in every room of my house. Remember those old-school bird feeders that you made in preschool? 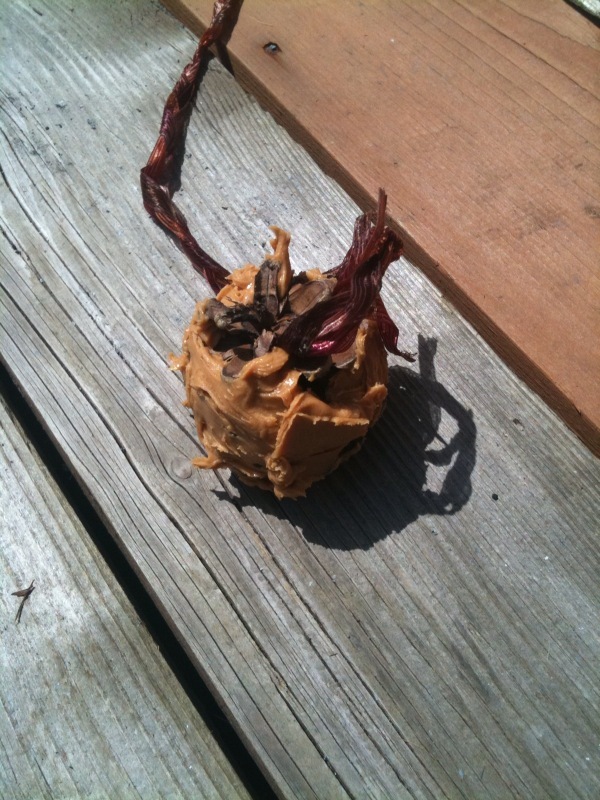 They consisted of a pine cone, peanut butter and birdseed, with maybe some yarn ties around the top. 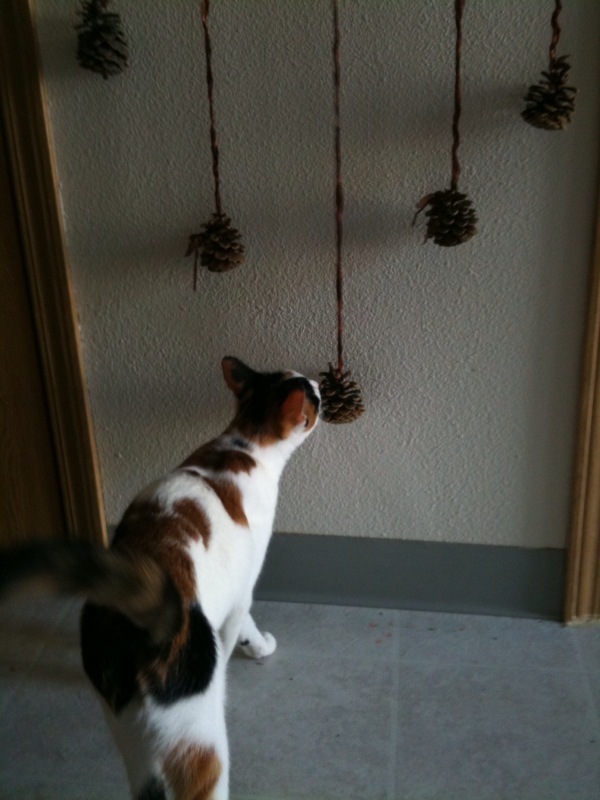 Recently, I wanted a birdfeeder to hang outside of my front window (to entertain the indoor cat–don’t judge me!). I looked at nurseries and home improvement stores, but was surprised how expensive the available bird feeders were! Also I needed a rather large/long birdfeeder since I would have to hang it from a tree branch higher than the top of the window. Thus, the pinecone/peanut butter method came to mind. I knew there had to be a way to use the same old technique but make it look fresh and modern. I used some cheap-o ribbon yarn and braided various lengths (with the idea that the braids would be stronger than a single piece of yarn, but feel free to ignore that step if you’re short on yarn). Braid not-too-loose, not-too-tight. Slip the top of the pinecone in thru one end of your braid, and slip the other end over your stick (that’s where the not-too-tight braiding comes in handy). 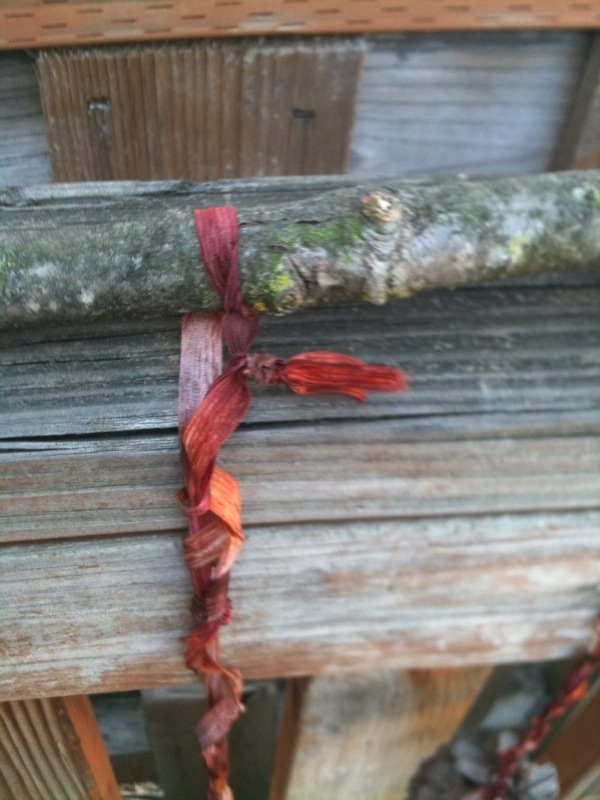 Lastly, use a long braid over each end of the stick and your structure is complete! My kitty thinks that this is a new toy for her to bat around. All that’s left is to coat the pinecones in peanut butter and then bird seed!